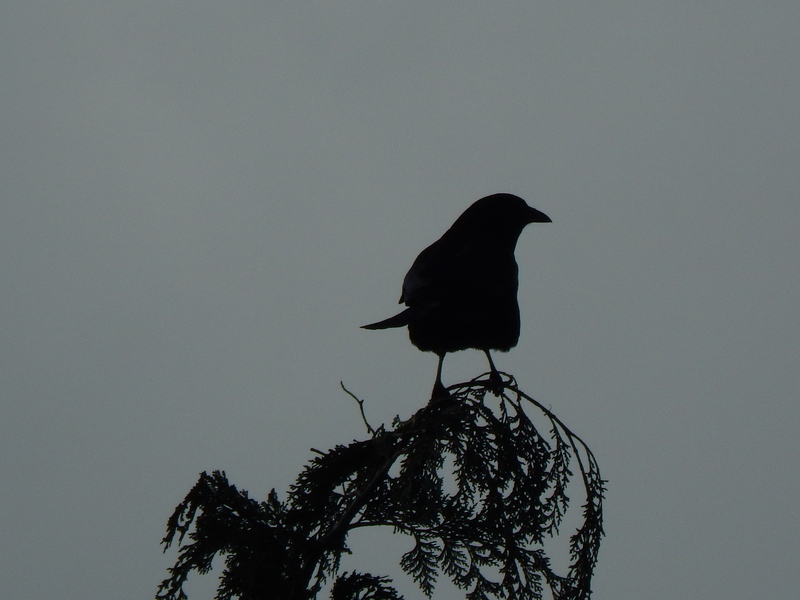 This crow way up at the top of the fir tree was on the wire holding a stick. Then he went flying by me to this tree. See in picture above how that stick he has is poking out to the right side of him? 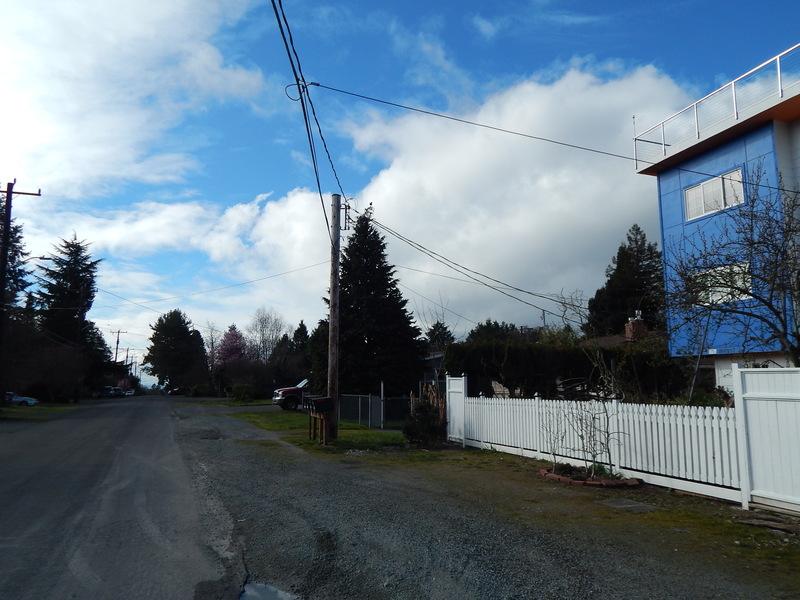 Here is a photo of another crow with a stick to give you an idea of how he looked before he got to the tree plus a wide angle look at the neighborhood he is living in. Not so fast this crow said! When he saw me, he tucked his stick into the tree top. He (she) did not trust me or thought maybe a peanut was coming soon. The stick could be retrieved later. I tried waiting him out by hiding a little behind my coat collar. Turned away and waited some. But every time I looked back he was still watching me and no heading to the nest with the stick. Crows are just so secretive. They know their children’s future is precarious and so they don’t want anyone to know where they are or are going to be. In this photo below you can see how he stashed that stick. See the stick poking out on the left of him? It is all ready for future retrieval when the coast is clear! 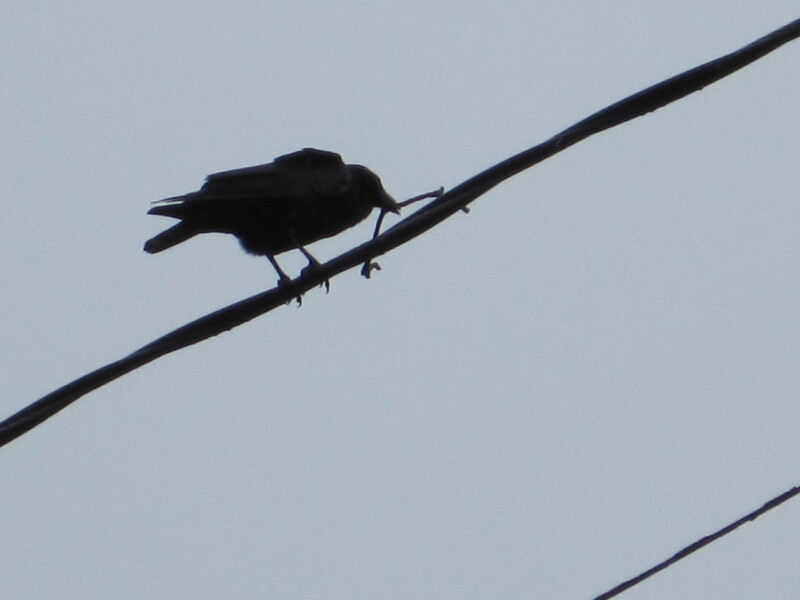 Crow stashed stick in tree while he watched me below. I get excited this time of year because as I see the sticks fly by they lead me to where the nest will be. Baby crows are in our future! ← Optical Illusion or Just Spring Flowers!